Okay, AMANZI is a rated PG environment, but you know how we wanted to finish that name. Right? Go Ape Sugar. Go Ape Shizah. Go Ape… well, let’s just say crazy. The ape skulls and banana peels make for a real awesome look that is going to get you totally stoked to hit up the pool. Be careful not to slip on a banana peel and make a fool out of yourself though. Also, don’t tell your mummy what we almost called this Silicone Swim Cap- you’ll get us in trouble! 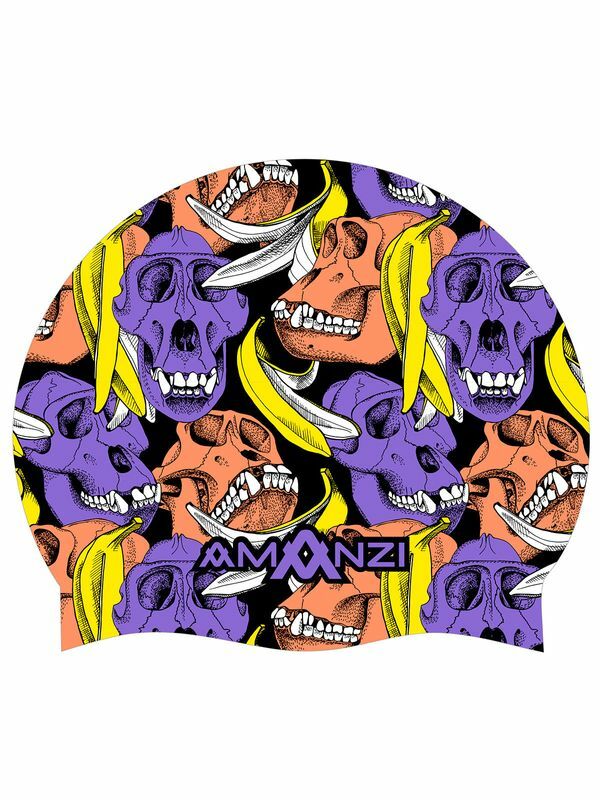 The Go Ape Swim Cap has been designed by AMANZI Swimwear. AMANZI (a-marn-zee) meaning water in Zulu, is an Australia sports swimwear company specialising in chlorine resistant training swimwear for competitive and active swimmers. AMANZI was created to satify the needs of the fashion forward athlete with designs that are functional and highly durable. The team at AMANZI Swimwear understand that swimwear is not just something you swim in, it should also be a reflection of your unique style and personality. AMANZI puts a great deal of effort into their prints so that you can feel comfortable in your swimsuit and look great!